This is my first post here, just created my account a few minutes ago. I apologize if I violate any type of forum rules or formatting, but I'm sure I'll learn as I go. To begin with: I've been riding dirtbikes since I was 8. I am currently a 19 year old University student in upstate NY, and I am riding a 2006 Honda XR650L that I bought myself when I turned 16. I've attached pictures of it (taken today, as I wrote this post) to illustrate the condition it is in, what it looks like, etc. While I have been riding for an extremely long time, and consider myself a safe and competent rider, I have a very limited mechanical knowledge of motorcycles. My dad introduced me to bikes and taught me to ride, but my riding experience over the years has been on my own, and my mechanical knowledge is self-taught and basic maintenance of my bike at best - nothing fancy whatsoever. He and I don't really speak anymore, and therefore I don't have any type of guidance or reference points when it comes to bike mechanics (or mechanics of any kind, for that matter). 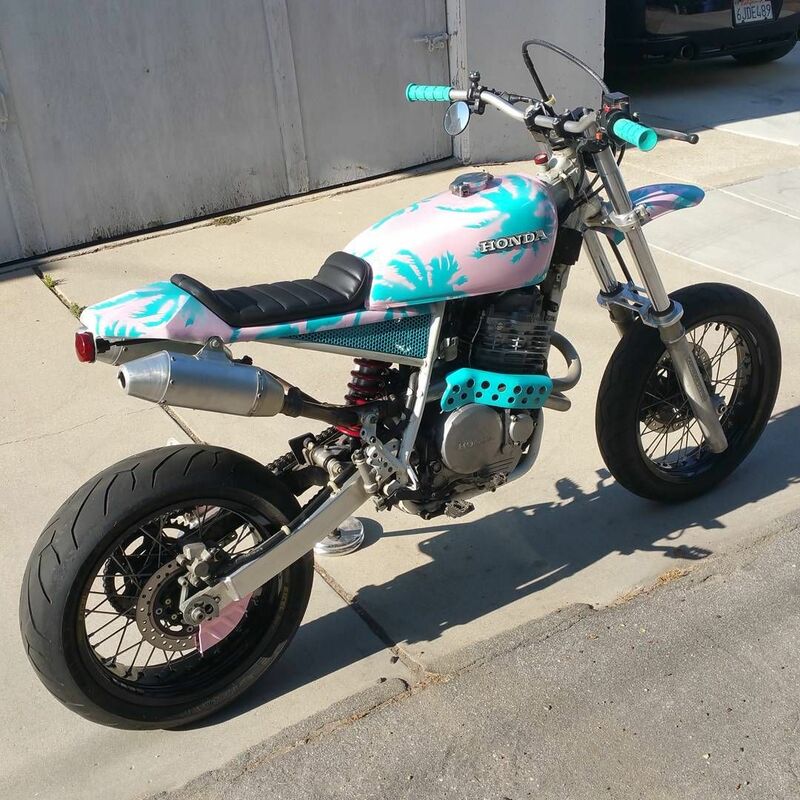 Nevertheless, I am very interested in modifying and improving my bike and possibly beginning a project to convert it into a café racer or scrambler-esque bike. I rarely go off-road anymore and use my XR as a daily driver, but I find the traction of off-road tires to be favorable and have never had street tires. Therefore I'm debating whether or not to keep my off-road tires (or get different ones), making the bike more of a scrambler - or to use street tires making it more of a café racer. If I'm using terminology wrong and have no idea what the f**k I'm talking about, then please always feel free to correct me. I am using Daniel Peter's custom XR650L café racer, and Ready Moto's brat/cafe racer as inspiration. I think both are beautiful bikes/rebuilds, and want something very similar as my final product. However, I think Daniel Peter's bike is tricked out in a very expensive (and unnecessary to me) way (i.e. antelope seat, c'mon dude). I also want to preserve my passenger seat and pegs, if possible. I have absolutely no idea where to start, and have no current access to welding or fabrication machines of any kind. I'm asking for a full walkthrough and as much help as you all are willing to give me. Because I'm in school, I have a very limited budget. Basically, I'm willing to do my short term modifications and enhancements, and probably put the conversion project on hold until the spring. This is particularly dependent upon the advice I get. I don't need the bike as much in the fall, because I live on my college campus, but it's nice to have around in working condition (I know the project would require pulling it all apart and not riding for a while). So if any part I need for this is expensive but necessary, I will save up for it and make it happen. If there are cheaper, reasonable alternatives to achieve the same goal, then I will do that. I'd appreciate all advice along those lines. I just replaced my battery two weeks ago, and am going to attempt to replace the brake pads (a simple job, I know, but with luck/mechanical ability like mine, it can be quite daunting!) The chain is new, the frame has been reinforced at certain points, but everything else is stock! 1. I'd like to put the battery underneath the seat - what are the benefits/disadvantages of this? To my knowledge it'll just slim the profile of the bike when I take off side paneling and prevent the battery from getting wet or as damaged in a drop. 2. I want to clean it up, particularly the rusted parts, and possibly repaint/replace them to make sure the bike looks better. (Need guidance for this, as I'm unsure how to remove rust/how to go about repainting parts - why I posted pics, so hopefully this community can identify where my "problem areas" are on this bike). 3. Learn how to properly winterize and maintain bike. Currently I check oil regularly, fill it with premium gas, lube the chain once or a week or more, and wash it (probably not enough) and spray WD-40 on various pieces. If I'm an incompetent fool, tell me. 4. Replace footpegs, throttle, handgrips. 5. If feasible with my current bike, put in a circular (brighter) headlight instead of the stock square one. Am willing to get rid of red plastic housing, or find an alternative. 1. A full café-racer type conversion, styled similar to what I linked above. My dream "bought brand new" bike currently is a Triumph Bonneville converted to a scrambler (provided a pic) to let y'all know what I'm interested in, aesthetically. 2. Switch out stock carb (40mm) with a 41mm Keihin FCR-MX flat slide. I've been doing lots of reading, and it looks like this will drastically improve bike performance and throttle response in many ways, not limited to AFR and starting. I know nothing about AFR...or carbs. 3. Repaint the sucker! I've read online various opinions, the main camps seem to be either (a) don't do it yourself, have a professional do it or (b) you can do it yourself very carefully. Sorry for the giant wall of text, I appreciate those who have read this far. Please ask any questions, give comments, critiques, advice, anything! I look forward to hearing what the TT Community has to say. I replaced both front and rear brake pads because I had irresponsibly been using very worn-down ones, and the friction subsequently wore down my rotors. Not bad enough to replace rotors (thank goodness, I'm too cheap for that right now), but still negligent on my part. Started taking the most rusted bolts out and WD40+steel wool scrubbing them, then putting grease on. I don't have any never-seize, but I'll get some at some point. For now, grease should suffice. Going to wash the bike soon, scrub everything down and then get to polishing up....everything! Can you post a "Cliff Notes" version? I'm guessing the first few photos are of the actual bike. The last Honda photo looks good, although I don't know why anyone would want to get rid of the original single shock. Just have it modified so that it's lower and has half the travel. That pink and baby blue one is just too weird. For a Cafe bike, I would get different forks that don't stick down below the axle. Changing the front end gets you the better brakes while you're at it. Separate post, or just add a condensed version at the top? Please don't make changes to the original. A nice separate summary would be nice. Made a new short post, included pics there too. Basically just looking for advice (very specific, step by step) on how to get started in a rebuild of my XR650L, parts required, tools required, any general tips on advantages/disadvantages of doing so. Not just for the rebuild, also want advice on painting, getting rid of rust/if parts need to be replaced, and more. Sorry the post was long, but I felt it was all relevant to what I wanted from the forum. The new post is easier to follow. It would have been nice to start off here like that with a link to the longer original version in the other place where people like me never look. I'll post my opinions on the new version. The last Honda photo looks good, although I don't know why anyone would want to get rid of the original single shock. The twin shock bikes , and even the early pro-link XRs had round frame down tubes , that bike's is square , meaning it was originally a single shock frame. remotely familiar with single shock XRs , you'll see the little details of the frame are identical. Let's stay on topic with my bike and not the random cafe racer I tagged guys haha, any advice for me? Yeah, keep the single shock. Make it a Supermoto , it'll do everything you want , with the least expense , down time and modification.